US Foods® is a leading American foodservice distributor, partnering with approximately 250,000 restaurants and foodservice operators to help their businesses succeed. With nearly 25,000 employees and more than 60 locations, they provide a broad and innovative food offering along with a comprehensive suite of e-commerce, technology and business solutions. They also operate 14 processing facilities - these include 12 Stock Yards® facilities that provide high-quality center of plate, custom cut and packaged to customer specifications; Freshway Foods, a fruit and vegetable processor, re-packer and distributor; and Save On Seafood, a seafood processor and distributor. 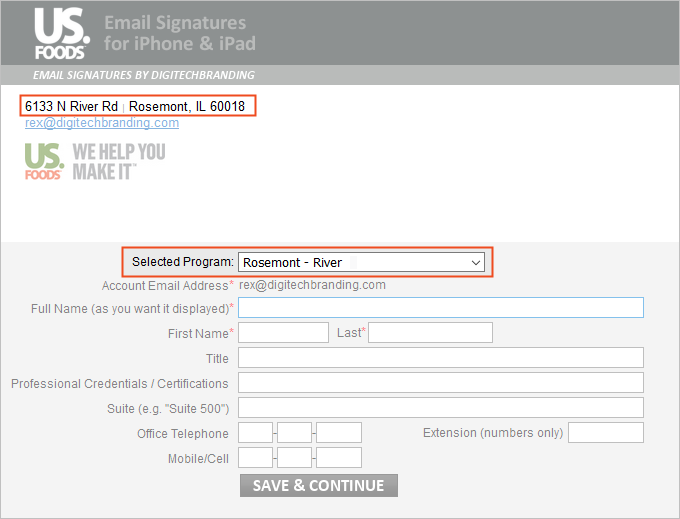 our tool is designed for PC desktops, and associates with Macs have instructions to update their signatures manually. need 3 addresses/locations, and an “other” category where associates can manually enter their address - We have 60+ locations, but, we have 3 main locations we’d like to give the option of the address pre-populating, for the other 60+ locations, users should be able to select “other” and type in their own location. We informed US Foods that their requirement to update the email signature on their mobile devices was not fully feasible, as Android devices do not support the installation of HTML signatures. 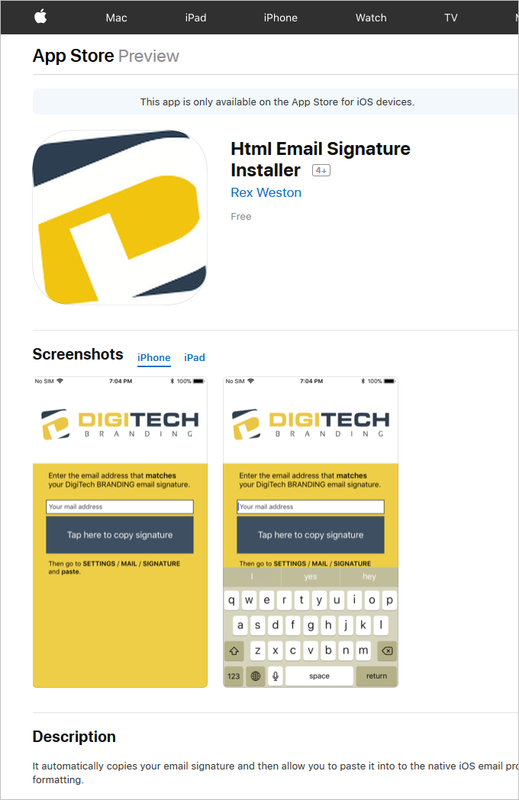 An email signature program driven by user-entered data coupled with our iOS mobile app. Because of the simplicity of the email signature’s content, and the need to pre-populate only 3 locations (and “other”), the development of the US Foods program was very simple and quick. Following a brief review and testing period by the US Foods IT department the project was cleared for roll-out. 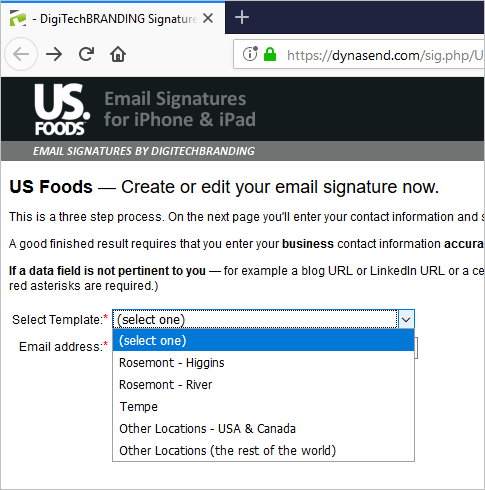 The signature-creation URL was distributed internally to US Foods employees and after 6 months 550 employees had utilized the tool to supplement their desktop email signature with an iPhone signature with zero reports of problems or need for support at any level. 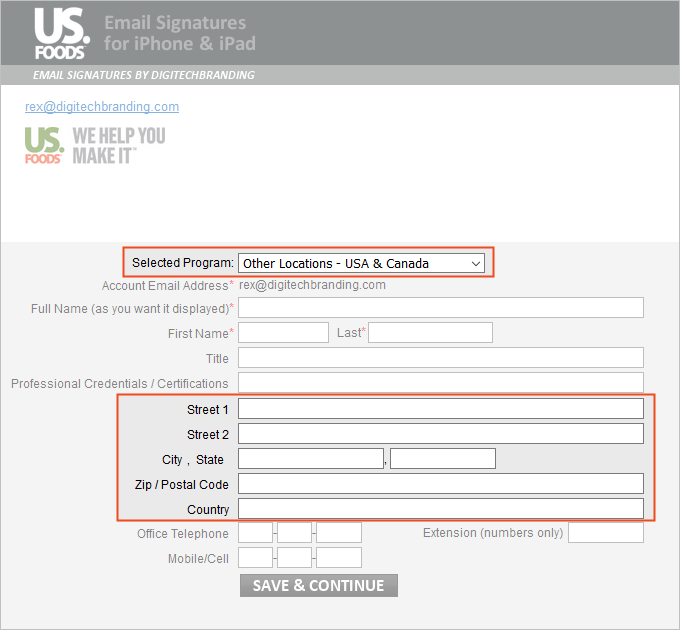 US Foods personnel and the DigiTechBRANDING team worked collaboratively over a period of a few weeks to complete and deploy a very well executed email signature program for iOS devices. DigiTechBRANDING has a customer that we’re proud to support, and US Foods has the assurance of continued prompt attention to their program on an as-needed basis going forward.